The Family of The Good Shepherd – Guardian Angels! I hope everyone had a lovely feast of the Guardian Angels! 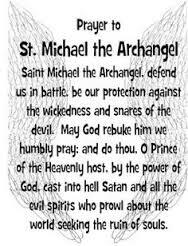 Of course September 29 was the Archangels Michael, Gabriel and Raphael, and between all these angels one of my favorite Saints…St. Therese the Little Flower! It is so true that God gives each and every one of us a Guardian Angel to be ours from the moment of conception to forever! I say the guardian angel prayer daily and talk with my angel like I do the Saints! Of course to have the names of 3 of the Archangel in Scripture and some examples of how they help us on a regular basis! Tied in with all of this is October is Right to Life month. Reminding us that all life if important from conception to natural death, and of course in the Light of Christ we are cared for too! It is also the month of Mary, the month of the Rosary. A meditation of the life of Christ from the moment Gabriel came to Mary clear through to the Queenship of Mary!